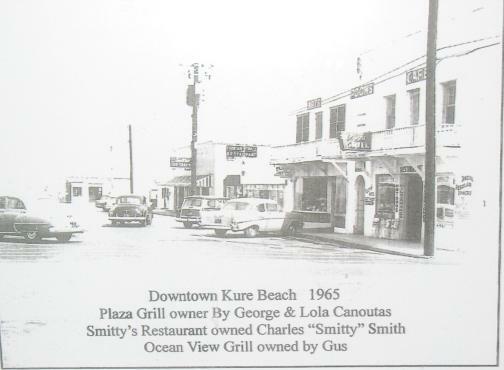 Dot was a waitress at Smitty’s Restaurant in the middle of the block on K Avenue in Kure Beach. 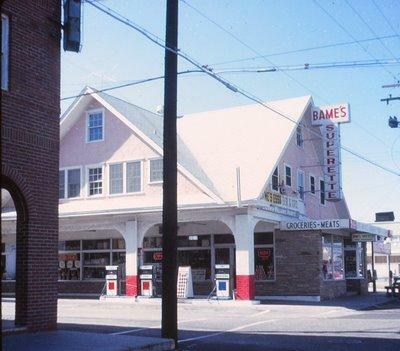 Smitty’s was known for all its nice, fresh seafood. On Mondays they got cases of shrimp to peel. Dot never peeled so many shrimp in all her days. Hush puppies were made by hand; so was cole slaw – mixed with a little vinegar, a little sugar, a little mustard, mayonnaise, and carrots. Some people loved onion in it, but no sour cream stuff. Dot says the best slaw that’s not home-made is Kentucky Fried Chicken and Smithfields. Dot met Hazel, Dub Heglar’s wife, waitressing at Smitty’s. Hazel Heglar started her restaurant in Kure Beach and hired Dot. Hazel did some of everything in her own restaurant. Hazel’s restaurant opened the beginning of March and closed in November. She would always have a Christmas party. Hazel loved to cook. She served “ole country” chicken and pastry – cook the chicken; take off the bone; put in the pot with gravy, a little salt and pepper, onions; roll out and cut pastry strips and add to the pot as it was cooking. When Dot makes chicken and dumplings, she stews a whole chicken and leaves it on the bones; and makes biscuits to add in. A typical menu in Hazel’s restaurant would be fish, shrimp, and crab – no clams and not too many scallops. They washed, breaded, and fried seafood and shrimp. Whoever sold Hazel fish, filleted them. Dot’s family members were not selling her fish at the time. Hazel’s menu would have 2 or 3 different kinds of meat. One was often country fried steak: fry your steak, brown your flour, put steak in with some onions over it; make a brown gravy. It was called country-style cause it’s cooked in gravy. She served fried okra, butterbeans and all kinds of greens, especially collards. People drank mostly iced tea and a lot of coffee. Hazel would bake wonderful cakes and bring them in. She’d say, ”I baked a cake today. Y’all want a taste.” Most of the time, they would eat the cake or give a piece to anybody that wanted some. Hazel made banana pudding too. Dot likes to make old fashioned banana pudding; not the kind you make with pudding mix. Every now and then Hazel would serve ice cream. Sometimes she would buy pies from people who would come by to sell them. Dot went to work fairly early in the morning riding the bus to Hazel’s restaurant. She worked a full day from 6 til 3 – Not much packaged food; it was all from scratch. Dinner was from noon to about 2, just time for Dot to come home and cook for her family. We’d often have a day or two off. The other cook was Sara Wade. After Dot left Hazel, she went to the Board of Education and cooked in the school system about 10 or 12 years. When Dot first started with the school system, she cooked for old Sunset, then Carolina Beach, at Myrtle Grove, at Pine Valley, at Sunset and at the Bellamy. The Federal Point Historic Preservation Society held its monthly meeting on Monday, October 17, 2011 @ 7:30 pm at the Federal Point History Center, 1121-A North Lake Park Blvd., adjacent to Carolina Beach Town Hall. 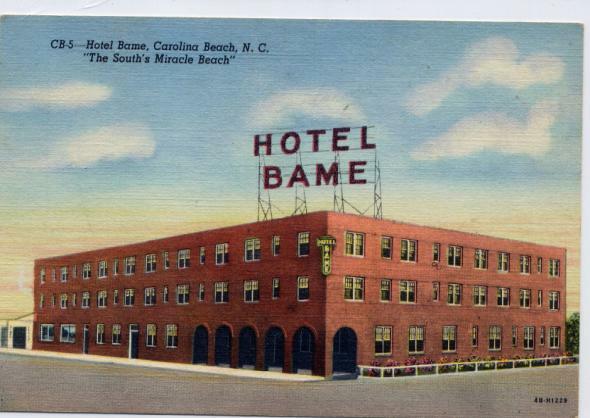 This marked the beginning of the Bame family’s relationship with Carolina Beach. It would grow to include several beach businesses, hotels, piers, two Carolina Beach mayors, a fire chief and span three generations. This presentation will tell the story of this remarkable family who made such a mark on our beach community. Our presenter was Elaine Blackmon Henson who is the author of Carolina Beach: A Postcard History and has also written several articles on area history. She has served on the board of the Historical Society of the Lower Cape Fear and currently serves on the board of the Federal Point Historical Preservation Society.